Exciting projects made before your eyes on "the Router Workshop" Series 700. An 1800 Lap Top starts the list of projects included in this series. 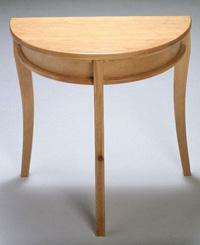 See how Bob and Rick curve the wood in the front of the Crescent Table. Do you have a deck or patio? Make Deck Tables with their own storage cart. 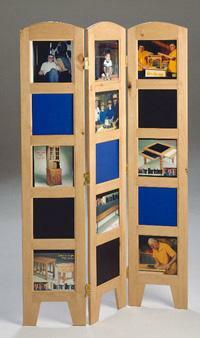 A great conversation piece to any room is the Privacy Screen which serves as a family picture wall at the same time. Swiss Chair shows dowel legs on compound angles. It sounds difficult but Bob and Rick show you that it is really quite simple with the router and some shop fixtures. Dress up that vacant corner with a two-part Corner Cabinet. Even if you never intend to hang a door, you may discover why your patio door does not close properly. Episode 701 Deck Table Unit Part 1: During a "Busman's Holiday" in sunny Australia, we came across a unique variation of our North American TV table which uses 'gate-leg table' construction. We've added the traditional table cart to create the "Deck Table Unit". In the first of a special two-part series, Bob and Rick Rosendahl show you how to make the deck table in your shop. While Bob shows you how to pattern cut the circular top, Rick uses a unique dowel fixture for the router to plunge holes in the legs, stiles and rails of the unique hinged pedestal base...today in the "Router Workshop"! 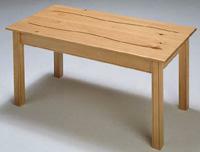 Episode 702 Deck Table Unit Part 2: In the second of a special two-part series, "the deck table unit"...master craftsmen, Bob and Rick Rosendahl show you how easy it is to make one in your shop. In this episode we move on to the "Table Cart". Bob will show you how to create sturdy, laminated wheels while Rick reveals the secret to creating a perfect handle for the cart frame...on part two of the "Deck Table Unit"...today in the "Router Workshop"! 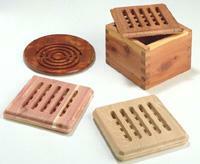 Today in the "Router Workshop", Bob and Rick Rosendahl craft some of the most unusual trivets. Rick shows you how to make a jig for cutting perfect square trivets and adds a decorative mold to the top and bottom! Bob shows you how to make a jig and cut beautiful round trivets that are sure to be a hit at craft shows everywhere. That's all on "trivets, trivets" today in the Router Workshop! In one of the most unusual projects ever, master craftsmen Bob & Rick Rosendahl create an exquisite walnut "escritoire" or "writing box"! The ‘lap top’ of the 15th century, the "escritoire" was the original desk. Today, Bob will show you how to cut the 15 bevels for the rounded lid while Rick cuts perfect box joints for the delicate little tray! Top it off with a discussion of the unique hardware installation and you have "the writing box"...today in the "Router Workshop"! This time in "The Router Workshop", it is a "privacy screen" with a unique personal touch. Bob and Rick show you how to use 'panel door' construction techniques to mill the stiles and rails. Bob routs the backs to hold your favorite photos and then sets up to cut the ornate top using one of his famous shop-made jigs. Make your own privacy screen. Watch the "Router Workshop"! Router experts, Bob and Rick Rosendahl show you how to use your router station to create an interesting piece of furniture you can proudly display in your home. Bob uses another unique jig to cut the delicately tapered and sculpted legs while Rick shows you the secrets of the half-round top. As beautiful as it is functional the "crescent table" is sure to become one of your favorite projects...from the "Router Workshop"! A true European craftsman and his remarkable skill provided the inspiration for today's "Swiss chair" episode in the "Router Workshop". 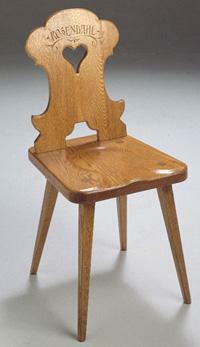 Master craftsmen Bob and Rick Rosendahl will show you how to pattern cut the chair seat and back, taper the legs with a 45 v-groove bit as well as the secret to cutting perfect, angled dowels on the ends of the legs. 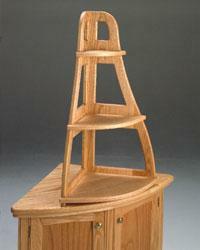 For router tips on chair construction watch the "Router Workshop"! This is a project as unique as it is beautiful. These are "step drawers" and they're perfect for the kids room...college dorm...family room...almost anywhere. Router experts, Bob and Rick Rosendahl show you a quick and easy way to use half-lap joinery in the case work. 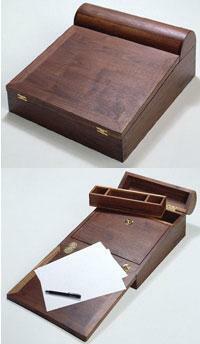 You'll also discover a unique method of box jointing the modules and the delicate little drawers. Another project that's sure to be the hit of craft shows everywhere. Watch the "Router Workshop" TV program! Planning a remodeling project or wondering why your doors do not open properly? You will want to be with us for this episode of the "Router Workshop", as router experts Bob and Rick show you some of the tricks of the trade in the construction and renovation fields! Today we're "hanging a door"! Rick will show you how to layout and make your own hinge mortising jig. 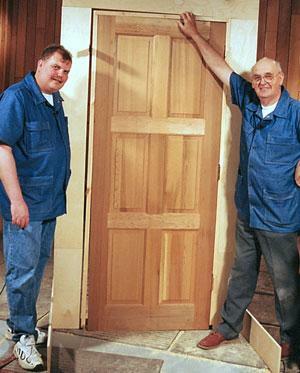 Bob mortises the door while Rick uses the same jig to mortise the jamb. Bob shows you a set of ‘door jacks’ that are amazingly simple to build. Discover the right way to "hanging a door" on the "Router Workshop"!